If you're an Anzula fan, you've probably heard of designer Vera Sanon. 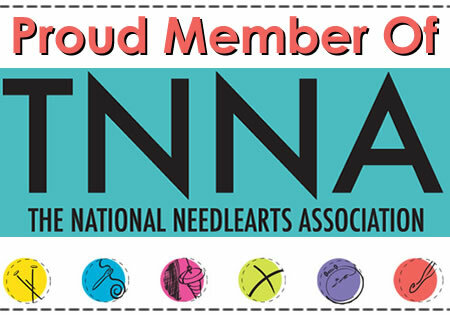 Not only has she designed several beautiful sweaters in our yarn this year, she created the Mermaid Shawl that was our entry in the fashion show at the TNNA trade show last month. Vera grew up in Germany, where she started knitting and crocheting at the age of six. Her great-grandmother taught her these skills, and at a young age she started working in her mother's yarn shop and helping to design garments for the shop. She puts those design skills to use today as she creates beautiful knit garments. She says “I am a plus sized woman, at 6 feet tall, wearing a size XL and 2XL. Thus, I design what flatters my body because in the “real world” lots of women are built like me.” She focuses on top-down methods of construction so that garments can be custom-fit as you knit. Customization is made easier by the fact that her patterns include a wide range of sizes. For example, the Symmetry in Motion pattern shown below can be made in any size from XS – 4XL. I asked Vera about designing with our yarns and she said “I absolutely love the high quality of the base yarn and the vibrant and beautiful colors! Also, unlike many other hand dyed yarns, I find very little difference in the color from skein to skein. Thus, I do not have to do the “dreaded” alternating two skeins every two knitted rows when I work with Anzula yarns!” She knits many of her projects in bright colors but really enjoys the grays in Elephant and Charcoal. She also confesses a love for 1 Red Shoe, which she says reminds her of a popular 1950s lipstick color. You can see more of Vera's patterns on her Ravelry store page, or click the photos above to be taken directly to that pattern's page. Start a lightweight cardigan or accessory now, or plan for your fall knitting!